Co-organizers : Power Memory, Brilliance Brain Enterprise, Smart Brain Consulting and NH Memory Training Centre. The Organizing committee of Malaysia Memory Sports Organization (MMSO) is pleased to announce that the 3rd Malaysia Memory Championships will be held on 10 & 11 November 2018, at Heriot-Watt University Malaysia Campus, Putrajaya. This Championships endorsed by World Memory Sports Council, London (WMSC) and it’s open to all Malaysian and PR of Malaysia. The Championship will be run according to World Memory Sports Council (WMSC) – National Standard of Memory Championships, which is to compete in 10 disciplines. There are 4 different age categories, which are Kids, Juniors, Adults, and Seniors. It is also a qualifying round for Malaysia’s memory athletes who are planning to participate in the 27th World Memory Championships, 2018 in the wonderful city, Hong Kong. We are honored to have WMSC Level Two Arbiter, Mr. Teo Kim Foo to be our Chief Arbiter for this Championship, followed by the senior team of arbiters Mr. Wong Wan Jiun (GMM), Mr. Nigell Hoh, Mr. Ng Kiah Tong, Ms. Moh Ee Ching, and Mr. Alexander Lee Ik Haur. We are proud to have Heriot-Watt University, Malaysia Campus in Putrajaya to be our venue sponsor together with famous Restaurant Mohd Chan Malaysia, Scand.a Projector Phone, Stabilo and Dreamic Edu being the partners. Medals and certificates will be presented to winners of all disciplines and trophies will be awarded to top 3 winners of overall categories. 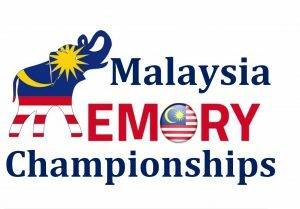 We are looking forward to have more great records happen in the 3rd Malaysia Memory Championship, 2018. *Minimum number of six (6) participants required in each category to consider the cash prizes.